A few photos from last night’s show at the M Room which featured an amazing performance by Dinosaur Feathers and an absolutely captivating solo set by Joe Michelini of River City Extension. Big thanks to the bands, everyone who came out, and especially to Emma of The World In A Paper Cup for co-hosting the party. If you weren’t there you missed some fantastic music. Come on out to the party this Sunday Night at M Room in Philadelphia when Bag Of Songs along with our new friend Emma from The World In A Paper Cup bring you two amazing bands. First up, Emma’s pick is Brooklyn’s super cool Dinosaur Feathers who whip up a mix of layered percussion, acoustic guitars and keyboards, along with overlapping harmony vocals that’ll have you hooked from the word go. 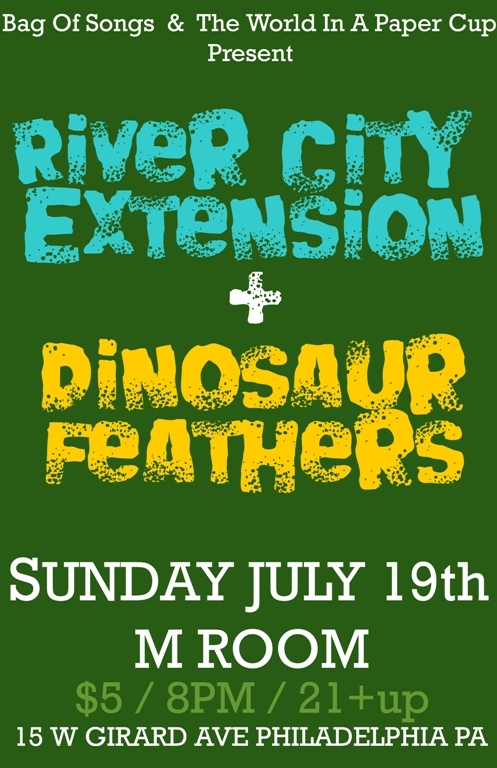 If you’re digging bands like Animal Collective, Yeasayer, Fleet Foxes, or Grizzly Bear, you’ll want in on the Dinosaur Feathers action for sure. My pick for the evening is New Jersey’s River City Extension, who I first caught as The Broken Bell‘s pick in the May Battle Of The Blogs at The North Star Bar. Their frenetic live show made me an instant fan, and has been earning them well deserved comparisons to bands like Gogol Bordello, Man Man and The Avett Brothers. A category defying blend of folk,gospel blues, country,even a little punk and pure unadulterated bliss. it’s music guaranteed to make you move, or at the very least it will move your soul.